There’s always hype about the next great generation, the ones who will fix problems and shake things up. More often than not, the generation in question fails to live up to unreasonable expectations. Now it’s the turn of the millennial generation to bear the load. There’s always hype about the next great generation, the ones who will fix problems and shake things up. More often than not, the generation in question fails to live up to unreasonable expectations. Now it’s the turn of the millennial generation (also known as Gen Y, my generation), to bear the load. The good news is that we’re already well on our way to matching those hopes and likely going well beyond. We elected a president, founded powerhouse social media platforms like Facebook and Foursquare. We’re already in high-ranking positions affecting change at the White House, the State Department, the halls of Congress, and major news media organizations. What’s more we’ve started our own business and not for profit organizations with unique ease and passion. We’ve embraced a new set of social norms and values celebrating diversity and difference–a lot for a generation where most of us haven’t even turned 30 yet. For my own part, I’ve spent the past three years studying, observing, discussing, and living the millennial generation and found it to be accomplished (yet unwilling to rest on its laurels), pragmatic (yet boundlessly idealistic). There is a growing sense of consensus about the things that have shaped us, from events like the terror attacks of September 11, 2001, and the recession to inventions like Facebook and the iPad, the occurrence of these events in the lives of millennials has been well documented and discussed. But what impact has the immense amount of change and activity our world has seen in the past few decades, as this generation has grown up, had on us and what impact will it have in the years to come? 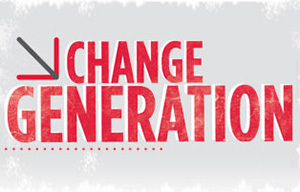 In the months ahead, we’ll answer that in this profile series, Change Generation. You’ll hear from young leaders in their own words and see how we’re changing business, not for profits, and technology. You’ll see this generation’s accomplishments but also see how members are disrupting traditional models simply because that is what makes sense. This is a generation of change, but we’re a product of our world and times.